WINONA LAKE, IND. – Grace College & Seminary’s 2013 Commencement will be held Saturday, May 11 at 9 a.m at the Orthopaedic Capital Center on the Grace campus. The ceremony, which commemorates the 75th anniversary of the college and seminary, will include an invocation by Michael C. Taylor, director of the Medical and Compassion Ministries of Encompass World Partners-Three Strands; an institutional recognition and tribute by Dr. James L. Custer, chairman of Grace Board of Trustees; to President Dr. Ronald E. Manahan for his 20-year tenure and final day as president. The tribute will include the Board of Trustees resolution to rename the Orthopaedic Capital Center at Grace College the “Ronald and Barbara Manahan Orthopaedic Capital Center.” The honor is bestowed upon the Manahans as a demonstration of gratitude for their 36 years of service to the institution and Dr. Manahan’s two decades as president. Dr. William J. Katip, current Grace provost and president-elect, will assume the duties of president on May 12. 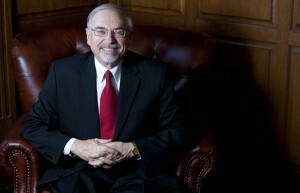 For the 2013 Commencement, Dr. Manahan has chosen Dr. Stephen A. Grill, dean of the School of Adult and Community Education, to carry the ceremonial mace in honor of his brother, the late Dr. E. Michael Grill, who served Grace College & Seminary for 35 years. Carrying the mace is a great honor and is traditionally borne by someone who has been singled out for tribute. Grace College and Seminary is an evangelical Christian community of higher education that offers undergraduate and graduate degrees and applies biblical values in strengthening character, sharpening competence and preparing for service. Grace College also offers flexible online graduate degrees, on-campus and online degree completion programs, and highly affordable, easily accessible two-year degree programs in Fort Wayne and Indianapolis. The 180-acre main campus is located in the historic resort town of Winona Lake, near Warsaw, Indiana.